Expedition 42 Commander Barry Wilmore and Flight Engineer Samantha Cristoforetti answer questions posed by CBS and BBC reporters on Dec. 30, 2014. As the crew of the International Space Station prepares to ring in the new year with a fruit juice toast, NASA today released a pre-recorded New Year’s greeting from space for everyone on Earth. 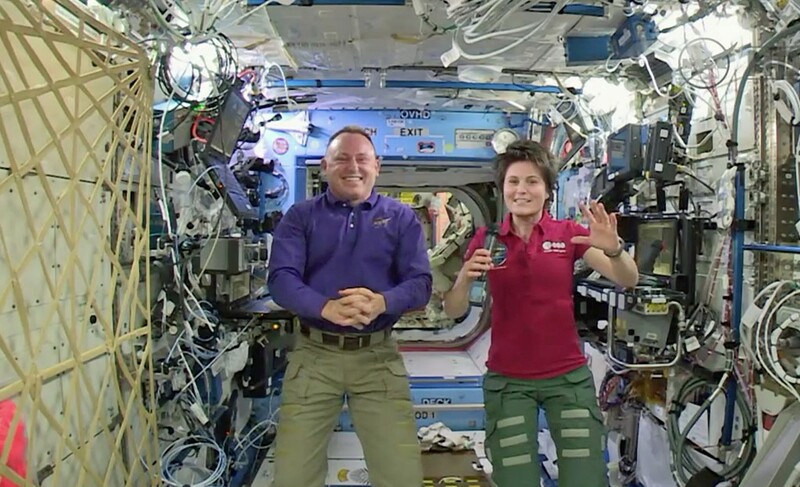 Expedition 42 Commander Barry “Butch” Wilmore of NASA and Flight Engineer Samantha Cristoforetti of the European Space Agency shared their plans for a New Year’s Eve celebration and some resolutions during an interview with CBS News and the BBC. The crew spent most of its day conducting a variety of experiments, ranging from human life sciences to physics and Earth observations, and threw in a good measure of routine maintenance on station systems. Cristoforetti set up hardware for eye exams using ocular coherence tomography, which records a detailed 3-D image of the retina and the interior of the eyes, so doctors may look to better understand why some astronauts return to Earth with long-term vision problems. Wilmore then conducted the tests on both Cristoforetti and NASA Flight Engineer Terry Virts. Wilmore also continued work setting up and conducting experiment runs with the European Space Agency Haptics-1 experiment, using a body-mounted force-feedback joystick and a tablet computer to help scientists learn how people in weightlessness might use such game-like hardware to someday control robots on another planet, moon or asteroid from an orbiting human spacecraft. Russian cosmonauts Elena Serova, Alexander Samoukutyaev and Anton Shkaplerov spent their day performing station life support system maintenance, testing a procedure for detecting air leaks on the station and conducting a Russian physics experiment on the dynamics of charged particles in space.